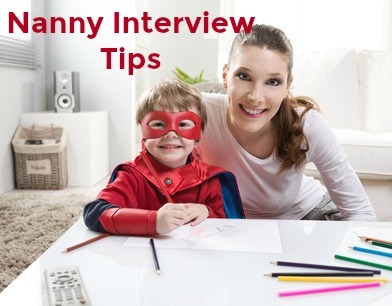 Practical tips for successful nanny interviews. Secure the nanny job you want with these 10 steps to success. Your complete guide to winning in the nanny job interview. 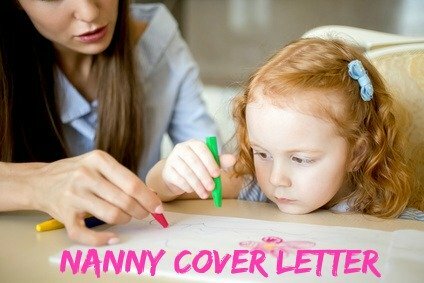 Sample interview questions for a nanny, good answer guidelines, the right questions to ask a potential employer in the interview and the best interview techniques for getting the nanny position. How to succeed in your nanny job interview. Get as much information as possible about the nanny job and the family before your interview. You should have a reasonable understanding of the scope of the nanny position and the job requirements. You can even go online and Google the family name. This may give you some helpful information. The parents may have profiles on social networks like Linked In and Facebook where you can learn useful information about them. 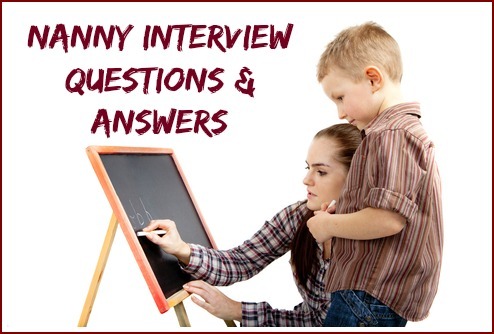 Think about and prepare for frequently asked nanny interview questions. Use the sample interview answers to help you. A good nanny will be well prepared with her questions about the family, the children, schedules. Use this excellent list of questions to ask in your nanny interview to demonstrate your enthusiasm and commitment to the job. Tell your references that you are interviewing for a nanny job and they should expect a call. Your references should be from people that you have worked with and who know you well. You can find good examples of reference letters here. If you do not have previous employment ask a well-respected person who has good knowledge of you such as a teacher, tutor, doctor or pastor to provide you with a character reference. You want to make a positive first impression. Dress smartly - a dress, blouse with a skirt or pants - and make sure your clothes are clean and neatly pressed. Lots of jewelry, high heels and too much make up are inappropriate for a nanny job. Any accessories should be kid friendly. Your hair should be tidy and not hanging in your face - this gives an impression of sloppiness. Go for a fresh, clean and practical look when selecting your interview clothes for nanny interviews. Reliability and dependability are key qualities for a nanny job. Make sure you arrive on time. Excuses about getting lost or stuck in traffic will immediately create an impression of disorganization and lack of preparation. Make sure you know exactly where to go for your interview and check for the best route. If possible make a practice run beforehand to get the timing right. Be as natural as possible. Sit up straight in your chair but not too stiffly. Lean slightly forward, about 10 degrees. This sends the message that you are interested and involved in the interview. Avoid fiddling with your hair or clothes and try to rest your hands loosely clasped in your lap. Establish a connection by making good eye contact. Listen carefully and speak in a clear and controlled voice. Use proper grammar and avoid sloppy language. Breathe and pause before answering a question, this gives you time to respond in a thoughtful way and ensures that you don't interrupt before they have finished the question. How to show the right interview body language. Generally parents are not experienced interviewers. They might ask simple, closed questions such as "Can you cook?" Don't just answer yes or no but use the opportunity to expand on what you can do. Describe what sort of cooking you have experience in and what you enjoy cooking. Provide relevant examples of your experience and competencies. It is appropriate to be warm and friendly but keep certain boundaries. Long stories about your personal life have no relevance to the nanny job and should be avoided. Rather than creating rapport with the family, sharing your personal sagas with them can cause concern about your suitability. At the end of your interview ask if they have all the information they need and what the next step is. This way you will know what happens next. Restate your interest in the position. If you promised to send through any information or documents do this as soon as possible. Iif you agreed to phone after a few days, make sure you do. You may be asked to come back for a second interview where you meet the children more fully. Be prepared to get down on the floor with the children and be hands on - dress appropriately for this. If there is a baby ask if you can hold him or her and remember to wash your hands first! What questions can I expect in nanny interviews? You can expect the employer to ask you these typical nanny interview questions. What questions should I ask an employer in my nanny interview? It is important to have some good questions ready to ask in your nanny job interview. Employers will be impressed by a nanny job candidate who asks insightful and well considered questions. In addition, you need to find out as much as possible about the job before accepting it. You can select relevant questions to ask from this list. 20 Questions to Ask in your nanny job interview.